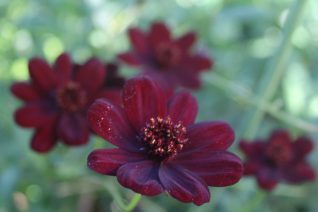 Chocolate Cosmos is one of our favorite seasonal plants. It blooms non-stop from June to frost with copious single deep red/black/mahogany flowers that have the special fragrance of dark chocolate. Forms colonies in well drained, rich soil with regular summer water. Cold hardy to the upper teens it will overwinter most years in very well drained soil- try a hot south facing slope. Otherwise, it forms a tuberous root and may be lifted and stored like a Dahlia in autumn. A great tender perennial for containers, borders. Fantastic cut flower. Mexico.